We have a storm door and the heat that it creates (even before I painted the main door black this past spring) is kind of insane and puts a lot of limits on what I can do. I once made something out of a plaque of wood and sap started to seep out. I, of course, initially blamed my boys for putting something sticky on it, until I figured out what was really going on. Also, I can't use hot glue because it will just get all melty and fall apart. Believe me. I know that one from experience, too. And, it can't be something that is super thick because it will need to fit between the two doors without getting squished. Lastly, it should be something large enough and bold enough that it can be seen from a distance. You know what I mean? Really what is the point of going through the time and effort of making something if you cant even tell what it is from the road. I created this DIY Copper Grapevine Wreath in minutes this past weekend (plus dry time, of course). All I did was brush on the liquid copper leaf, getting the best coverage that I could. Of course because of the nature of what you are working with, there will be spots not covered, but that's OK. Just get as much of the wreath as possible (this is why the tiny brush comes in handy). 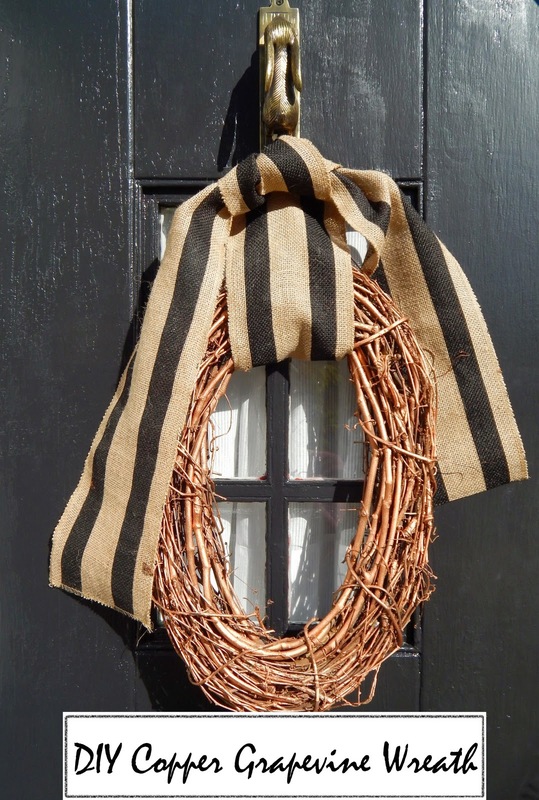 When the wreath was dry, I hung it up with the burlap ribbon, tacked it in place and tied a knot at the top. Super, super easy. I love how the copper leaf makes a traditional grapevine wreath more glam and unique! 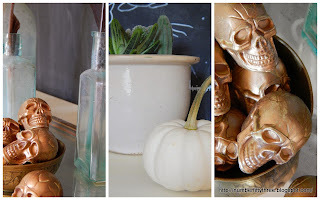 love the copper look and i love a quick and rewarding project! Really neat idea and I like what you come up with! Stunning - especially hung on your black door for contrast. It's perfect...I love the way it looks Angela! !